Furniture is the key element to any décor without which a décor can never be truly complete. Different kinds of furniture options can give a different definition to the look and feel of a space. What furniture you choose can literally make or break the look of your theme. For instance the country style furniture brings to your mind a relaxed casual setting where you can just sit back and unwind. Achieving this type of ambiance is not too difficult. You don’t need to actually restore some old farmhouse to get the country appeal. The laid back lifestyle feel can be easily achieved with the country style furniture. The old French farmhouse tables and other furniture options allow you to create a cozy and inviting space effortlessly. Country style furniture is all about comfort. These are simple yet elegant furniture options and are quite charming too. At Antique Tables we have some fine country style furniture options such as the old kitchen tables, large antique dining tables sets, French farmhouse tables etc that are just perfect for the country appeal. Paired with some good seating options these help you create an elegant yet very relaxed space. Since these old tables are quite rustic in nature, they manage to bring in the charming rustic grandeur to a space quite effortlessly. Take these large antique tables for instance. This table has a two plank elm top with a heavy refectory style frame. Gorgeous colour and has a lot of character. 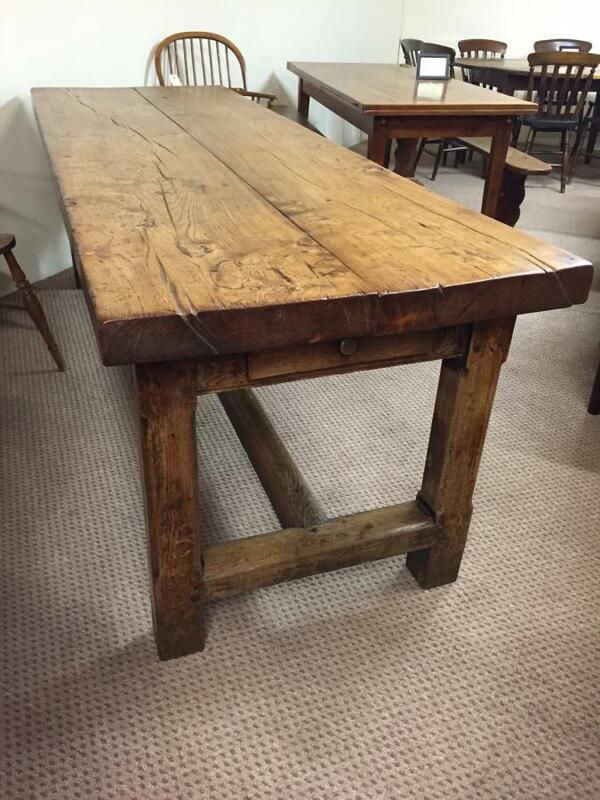 This Rustic refectory elm antique farm house table has a two plank elm top with a heavy refectory style frame. Gorgeous colour and has a lot of character. Coupled with this set of 8 Oxford scroll back chairs (This is a harlequin set of 8 Oxford scroll back chairs. Circa 1800. All beautifully restored and matching. Absolutely beautiful colour) makes a perfect country furniture setting.... in our opinion! These are simple and elegant with a few signs of age which adds up to its appeal. The worn look itself gives it an air of informality making these just perfect for the casual noisy gatherings with friends and family. The extending tables are a great fit in homes that are a little short of space but need that added seating option every now and then. These are again the country types and look beautiful with the wear and tear that they have seen over the years which just adds up to its character. Then we also have dining tables that can double as kitchen islands. Now days we see a lot of people ditching the traditional kitchen layouts for such inclusions. These tables have the size to be perfect for kitchen work and are suitable for dining too. You obviously will not have the heart to use the very old valuable tables as kitchen tables and so we have a few items from the recent past too that can easily do the job. Browse through to have a look at our amazing variety.